Supporting in Dota is hard. You need good game knowledge, good map awareness, a fundamentally team-play driven mindset and the ability to eek by with the bare minimum of items. Learning to play support well takes a lot of time and effort, as you have to grow your capabilities in multiple directions: you need to learn how to support your teammate in lane, how to gank, how to counter-gank, how to ward, how to find whatever farm you can... it's easy to get caught going down one track (warding for instance) and neglecting others. Which is to say; it's fairly easy to sink a ton of hours into learning support and still miss out on some things which are actually pretty fundamental. This post will cover some of the basics supports should, or, more accurately, should not be doing in the laning stage; the kind of things that you see all the time in public matchmaking, and that can drive carry teammates up the wall. An unhappy carry is a distracted carry, and no-one want them making mistakes late-game because they've had their morale upset early. Carries are delicate creatures! This is the #1 thing a support does that incenses their lane-mate: standing behind the carry, possibly attempting to deny creeps. It's hard to emphasize how terrible this actually is. 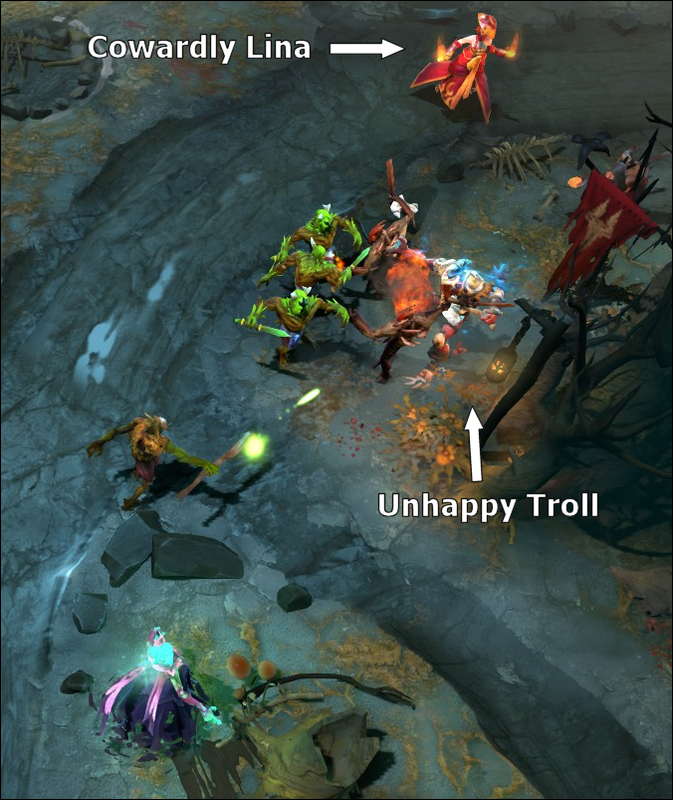 Hiding behind the carry, the support contributes nothing to the lane: they do not harass the enemy hero(es), and are not in a position to act if a potential kill situation occurs. Crucially, they also take half the XP from the lane. They are literally making the lane worse for the carry than if they weren't there at all. A support who spends the first few minutes roaming around accomplishing nothing is actually better for the lane than one who sits in it, actively having a negative impact (by stealing experience from the core). The normal outcome to a two-vs-one lane where the support does this is that the enemy hero gains a level advantage, then kills one or both of the dual lane.